Combining harsh beats with deep, mostly German lyrics creating unabashedly old school rhythms modernized for todays dance floors, Skyla Vertex burst onto the scene with crushing remixes for Santa Hates You (Rocket Heart EP) and Reaper (Dirty Cash MCD). 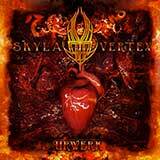 Now, the band's debut album Urwerk proves Skyla Vertex deserves the attention the band is starting to receive. The album shows that harsh beats and an intellectual approach do not need to contradict each other. Urwerk is actually a full concept album with 16 tracks (including remixes by Nachtmahr, Peter Spilles and Guest-Vocals by Orange Sector). Skyla Vertex is an intriguing new act on the German electro scene and Urwerk is an incredible debut.